This brief article is not intended to be technical or in-depth, but is instead aimed at giving businesses and individuals a chance to protect themselves against an increasing risk of losing files and important computer data to the threat known as Ransomware. So what is Ransomware? At its most basic level, it is a strain of malicious software (similar to a computer virus) that changes (encrypts or “scrambles”) the files on your computer without your permission or knowledge, making them unreadable so they cannot be opened, edited or viewed. In order to get the files back to a usable state, enabling you to view and use them once more, the ‘bad guys’ demand you pay a fee (or a ransom) to obtain from them the ‘magic key’ which will unlock the files. How does Ransomware get on my computer? Most of the time Ransomware gets onto your computer by opening an email attachment that has been sent to you from the ‘bad guys’ or even from another “infected” victim. These emails may be addressed from people you already know, your bank or telephone supplier or from companies you already do business with. The ‘bad guys’ are highly imaginative in ways of making their emails appear to be quite genuine. Sometimes the Ransomware infection can come from other sources as well, such as Social Media adverts, links from chat rooms, links within email messages or simply by visiting an infected website … and the list goes on and grows daily! The most important fact to remember is – PROPERLY DESIGNED AND IMPLEMENTED COMPUTER BACKUP KEEPS DATA SAFE FROM RANSOMWARE. How can I keep my computer and data safe? There are several things that can be done that won’t cost a great deal of money and will make it significantly more difficult for you to suffer a Ransomware infection. 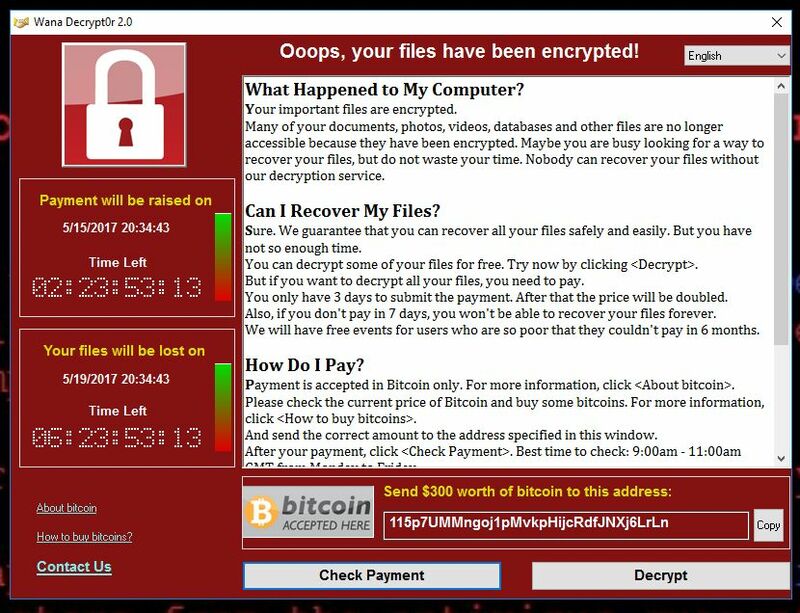 There are also steps that you should take in the event of a suspected Ransomware infection to minimise the potential impact and avoid being held to ransom thereby paying unnecessarily the £800-£1500 per PC to get your files back. Current recommendations (by UK Law Enforcement authorities) are that ransom should NOT be paid – it has generally been found that in more than 70% of cases, paying will not get a ‘magic key’ to unlock your files once more! Have good quality (we call this business-class) anti-virus. Yes you need to pay for it! This is not expensive, but the free versions are free for a reason – the manufacturers want to advertise to you to buy the ‘Pro’ version as this has better, more effective cover. This alone tells you that the free version you have installed is not doing the whole job of protecting your computer. Education is key. Make sure ALL your employees, partners, children and anyone else using the computer knows how to spot fake emails, attachments and website links. Ensure they understand the notion of “safe internet use”. The most important method of prevention and protection is to HAVE A CURRENT OFFSITE BACKUP! What does this mean? A proper data backup should be fully automatic, that way no-one has to remember to do it or can ever be too busy to get it done. It should be backing files up all the time (e.g. every time a file is changed), not just at set times of the day/week/month. The backup should also be independent of your PC or laptop, so it can’t be a disk that’s attached to the computer. Furthermore, the backup data should be sent out of your office, organisation or home and stored securely using the Internet (yes there are safe ways to do this) so that if anything happens to your PC, the data is still accessible by you, your organisation or your family. In addition, don’t forget, to test your backup! Make sure you know how to get the files back and check the process regularly to make sure the correct files are getting backed up. For some further bedtime reading, check out the “3-2-1 Backup Principle”, its what we use ourselves and recommend for our clients. So there you are, some simple tips and tricks to keep your business data or your precious photographs safe and sound – and in the event of your getting infected with Ransomware, your backup will save the day! If you are still unsure about keeping your data safe, if you would like some advice or maybe even a security audit undertaken for your business, then please do get in touch either by clicking the button below completing one of the Callback Forms on the website or by following the link to the ‘Contact’ page.